The measles outbreak in Katanga province in southern Democratic Republic of the Congo worsens and help and resources are lacking in the battle against the vial outbreak, according to the international medical humanitarian organization Doctors Without Borders/Médecins Sans Frontières (MSF). Official numbers put the outbreak over the 20,000 people affected, including some 300 deaths and it is spreading. More than 20 of Katanga’s 68 health districts are now affected—up from 10 districts in June, MSF reported Tuesday. DRC government officials have not declared an officials epidemic, which is likely burdening the response. During the last three months, MSF vaccinated more than 300,000 children and treated more than 20,000 measles-infected patients in five hospitals and approximately 100 health posts; however, according to Jean-Guy Vataux, MSF head of mission in the Democratic Republic of Congo it is not enough. In addition, vaccination campaigns also must deal with the geography of Katanga province, which can be difficult, and hard to keep vaccine in temp. 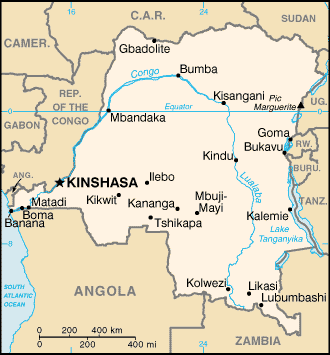 Katanga province is huge, about 16-times the size of Belgium at nearly a half-million square kilometers. Last week, the US Centers for Disease Control and Prevention (CDC) issued a travel notice for the DRC recommending travelers to the Democratic Republic of the Congo protect themselves by making sure they are vaccinated against measles, particularly infants 6–11 months of age (1 dose of measles vaccine) and children 12 months of age or older (2 doses of measles vaccine), in addition to practicing good hygiene and cleanliness.